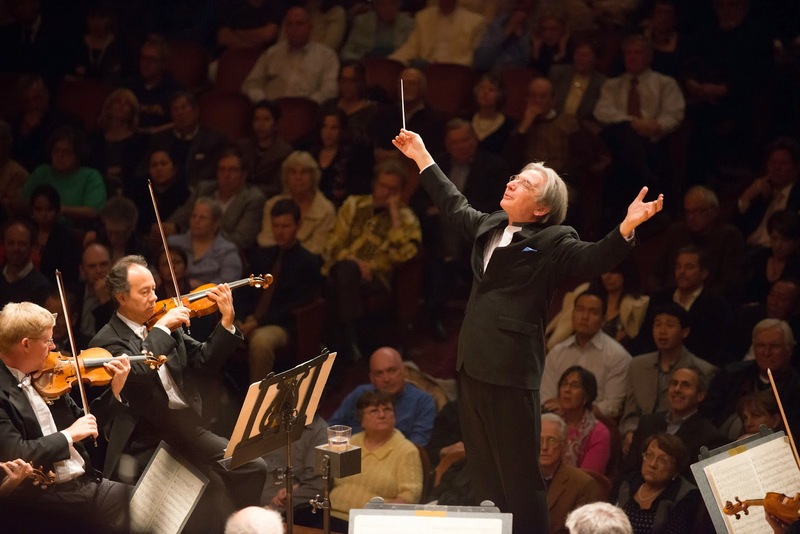 I'm very late with an appreciation of the San Francisco Symphony's visit to Celebrity Series last weekend, with Michael Tilson Thomas at the helm (as he has been for the last twenty years or so). The conductor received a warm welcome at Symphony Hall, as he's something of a favorite son in these parts - indeed, judging from conversations overheard at intermission, many in the crowd could remember the heady days he spent here as the BSO's Assistant Conductor in the early 70's (when he himself was barely in his 20's). At the close of the concert, Tilson Thomas even pointed out - to wild applause - the particular seat in the house right balcony that he once favored. I myself hadn't heard him for something like thirty years (egad! ), and like many Bostonians, I was eager to see how he had shaped the SFS sound - in a way, perhaps I even imagined I might perceive the lineaments of a BSO that might have been, if things (as they say) had turned out differently. And as if in anticipation of that, the conductor had shaped a program that bowed to both his own musical interests (contemporary American) and the music that was once a calling card of his former home (French impressionism). But first he kicked off the concert with two showpieces - Liszt's spirited Mephisto Waltz No. 1, and Prokofiev's beguiling Violin Concerto No. 2. The Liszt of course is most familiar in its piano transcription, where its pyrotechnics come off as lightly diabolical (they're meant to illustrate a moment from the Faust legend in which Mephistopheles takes up the lead violin at a village dance). Curiously, however, the orchestral original throws off fewer sparks than its keyboard sequel (perhaps because the piano's percussive quality gives the twisting themes an extra kick), and Tilson Thomas's reading felt a little too lyrical, and in places slightly sedate. Still, there was a gorgeously seductive quality to the cello line, and it closed with dark panache. The Prokofiev was subtler and stronger, and showcased the brilliant violinist Gil Shaham, who seemed eager to follow the conductor's lead rather than etch any independent profile for himself. Which works for this piece, you could argue - as it features no star-turn cadenza - although it does turn the "concerto" into something more like a "symphony with special guest." Still, Shaham was in superb form, and the Andante assai had just the right sensual quality, with its trembling musical "droplets" seeming to bead out all around the ravishing main theme. At the finish, however, the work began to feel like just another showpiece; the finale was spirited, like the Liszt, but suggested little hidden depth. After intermission Tilson Thomas unveiled one his more recent American premieres - Drift and Providence, by rising star Samuel Adams (who is the son of composer John Adams, rather than any relation to the famous "brewer and patriot"). The piece is clearly intended as an evocation of the sea - the composer even says so in the program notes; but he doesn't mean to mimic La Mer, he lets us know, but rather conjure the ocean as "an object of psychological remove in a highly digitized and distracted life." Okay. The piece does include a background soundscape of digitized spray, derived by the composer himself (via laptop) from the onstage percussion. But I'm afraid otherwise Drift and Providence is indeed rather like La Mer - the Pacific Northwest version, that is, as it comes complete with dark surges from the strings and bracing zephyrs from the winds (along with occasional nods to Daddy Adams' minimalism). The mood, it's true, is meditative, and far from sun-splashed - in fact it's cool and a little raw; and rather than chart his subject's shifting character over time (as Debussy did), Adams seems to want to evoke it from different places (tellingly, two of the movements were labeled "Embarcadero" and "Divisadero," which are street-names in San Francisco). The idea of embarkation as a concept was also somehow in the air - as the piece moved from "Drift" to "Providence," it likewise swelled toward a sense of triumph. But as the divide between natural and processed sound never really came into focus, the precise nature of this implied journey remained vague. Which suggested intellectual ambitions that the composer couldn't quite fulfill. Still, as millennial impressionism, the piece often impressed - which might have been the conductor's point, as he paired it with one of the high peaks of French impressionism, Ravel's famous second suite from Daphnis et Chloé. The work was once a centerpiece of the BSO repertoire - and no doubt Tilson Thomas got to know it well from his former seat in the second balcony, for under his baton the SFS offered up about as much passionate rapture as the work's most devoted fan could desire. Indeed, from the first fluttering breath in the flutes, the orchestra seemed as one, and Ravel's rising musical tumescence crested into crashing orgasmic showers just as it should; I think everybody in the place was a little limp before it was over. The house, of course, then roared its approval, and called out for more - but could draw Tilson Thomas back for just a single encore: Grieg's sentimental but ravishing The Last Spring - the kind of farewell that almost always draws a sigh from the audience. Like much in this pleasing program, it was hard believe its sweetness was entirely un-calculated; still, it was sweet; and this conductor's homecoming was pleasing indeed.